Some people hesitate to pursue a vegan diet because they fear not getting adequate amounts of protein. This, however, should not be the case as beans, nuts, seeds, quinoa, edamame, and peas all provide sufficient amounts when consumed as part of a balanced vegan diet. As a nutrition graduate student at Tufts University, I recently completed a course called Nutritional Biochemistry: Micronutrients. In this class, we rigorously analyzed the metabolism of vitamins and minerals and their requirement for the functioning of the human body. Along the way, I discovered that despite popular opinion, a more pertinent concern for vegans revolves around micronutrients rather than protein. This left me asking the question, "Does a plant-based diet provide sufficient amounts of vitamins and minerals?" Well, I decided to find the answer on my own, and thus began my two-month vegan challenge. In this blog post, I share a recap of my results and the important lessons learned. 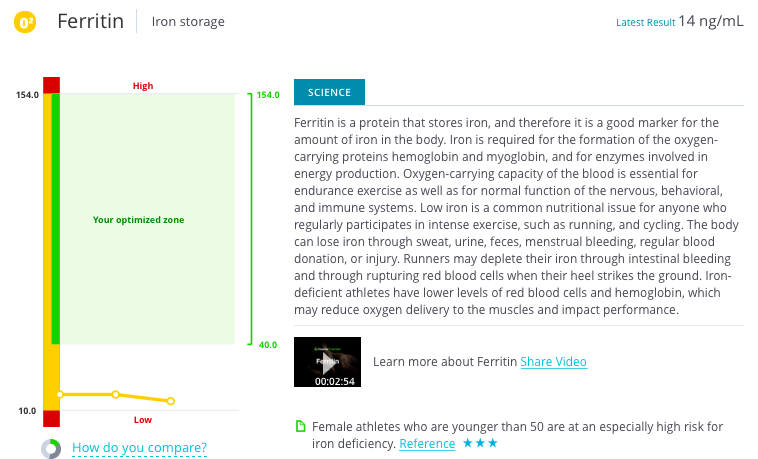 Using personalized blood analysis from InsideTracker, I monitored three key biomarkers – iron, calcium, and vitamin B12 – micronutrients difficult to obtain from a plant-based diet, and three measures of metabolism and weight control – glucose, cholesterol and triglycerides. Our bodies need iron to perform many physiological functions. Iron is required for the formation of hemoglobin and myoglobin, proteins that carry oxygen around the entire body. It is found in both animals and plants; however, our bodies absorb animal-sourced iron much more efficiently than plant-sourced iron. Since I was testing a vegan diet, I relied only on plant-based sources of iron. When I started this "experiment," my iron levels were "low" at 17ng/mL, and fell closer to deficient levels (14ng/mL) at the end of the two months. An iron deficiency, categorized as less than 12ng/mL, can cause fatigue, decreased physical and intellectual performance, lower levels of immunity and resistance to infection, and may even cause complications during pregnancy.2 If I were a lifelong vegan, I would strongly consider taking an iron supplement; alternatively, I would abstain from supplements and more actively monitor my plant-based iron intake. Vitamin B12 is an essential vitamin that primarily comes from animal products. Some animals, cows for example, produce B12 from bacteria in their intestines, which then passes into their byproducts (eggs, milk, cheese, etc.). Edible algae and some fermented foods/drinks like fermented soybeans, contain varying traces of B12, making them plant based but difficult to reach your daily needs. However, fortified cereals and non-dairy milks are readily available vegan products containing 25-100% of your daily B12 requirement. I relied on fortified almond milk as my main source of vitamin B12 consuming about a cup a day, equaling around 50% of my daily need. Although still in the optimized zone, my levels decreased after two months. Levels below your optimized zone can lead to fatigue, diarrhea, poor memory, and loss of appetite. More serious deficiencies may damage the brain and nervous system.2 Had I continued the experiment, I would have either increased my almond milk consumption, or considered taking a B12 supplement. One cup of fortified almond milk, however, contains 45% of your daily calcium needs. 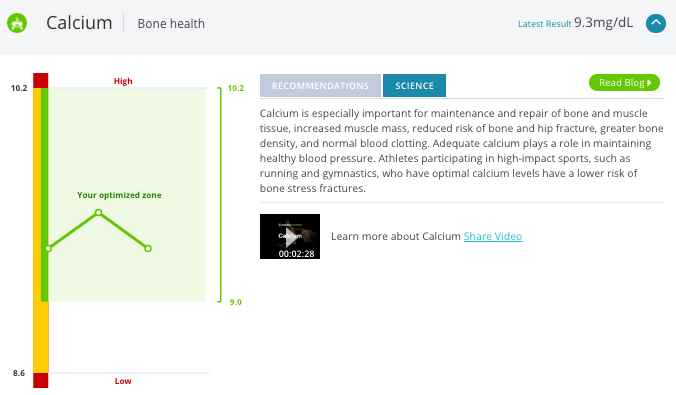 I relied on almond milk, broccoli, and kale for my calcium during my two-month experiment, but unfortunately, the result at the end of the diet indicated a deterioration in bone health. 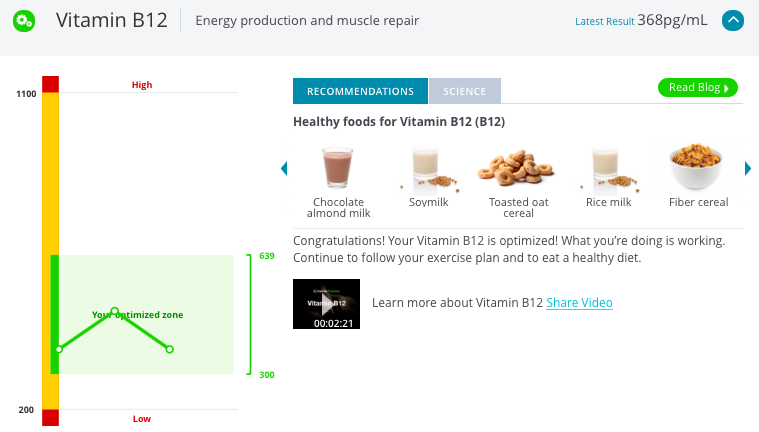 Similar to B12, if I remained a vegan, I would begin a calcium supplementation routine or increase my almond milk consumption to reach my daily needs. 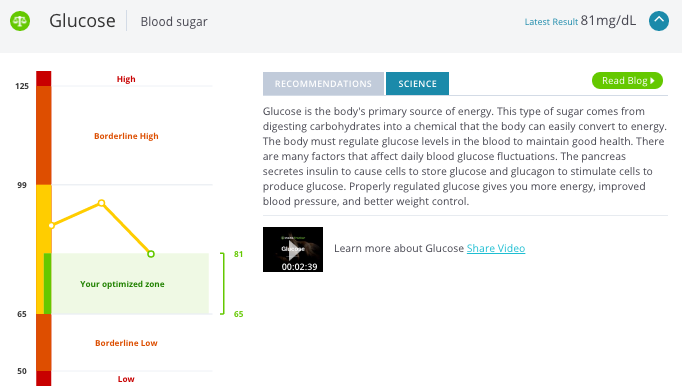 With an initial, borderline-high, glucose level of 97mg/dL, InsideTracker recommended that I increase my consumption of avocados, chia seeds, and old-fashioned oats. I took their advice, ate almost an avocado a day, and happily saw my glucose level drop sharply. Interestingly, my total cholesterol and LDL or ‘bad’ cholesterol remained unchanged while my HDL or ‘good’ cholesterol improved significantly. 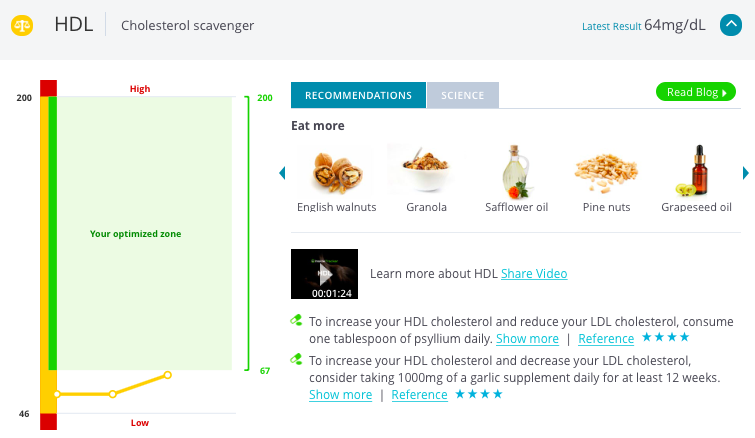 HDL cholesterol acts as a scavenger by gathering excess plasma cholesterol and depositing it in the liver, where it’s then broken down and excreted. Low levels of HDL cholesterol can increase your risk of poor heart health. Replacing saturated fats, such as fatty beef, cream, and cheese with unsaturated fats like avocados, nuts, and vegetable oils has been shown to improve cholesterol.6 As a vegan, my consumption of healthy fats increased significantly as I relied more on these foods to keep me full. Triglycerides are a form of fat found in both our blood and food. After we consume a meal, any excess calories we don’t use for energy are converted to triglycerides and are utilized later in times of energy need. Like cholesterol, normal levels are important to sustain energy, improve metabolism, and promote heart health. 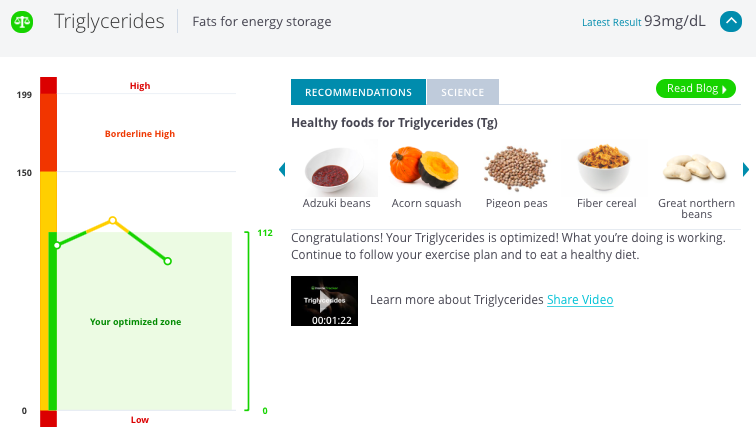 Vegan diets have been associated with lower levels of triglycerides6. My results agreed with current research findings as my levels declined into my optimized zone. So, would I recommend a vegan diet? It depends. 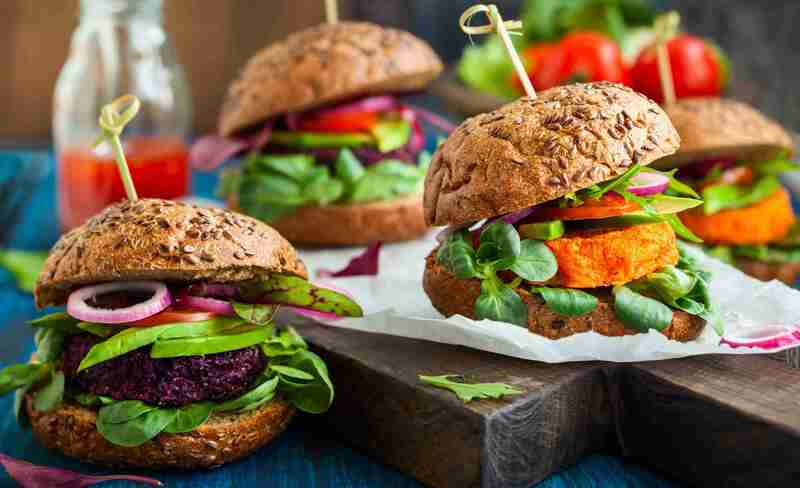 Veganism emphasizes a diet rich in fruits, vegetables, and whole grains – foods that should comprise the majority of everyone's diet. Research shows that plant-based diets may lower body mass index, blood pressure, cholesterol levels, and heart disease mortality rates. They also reduce the need for medications to treat chronic diseases7. Plus, plant-based diets cause less harm to the environment! So, if you suffer from any of the aforementioned illnesses, a plant-based diet may help you significantly. However, it may also put you at greater risk of experiencing certain deficiencies.